I like the help info window. It gives a nice explantion of the option. Yes/No Before booting you will be asked "Hit any key to boot from CD"
or the spaces and hyphens are something that Winbuilder added to your log? no, it has spaces. let me try again by moving it to another non space location. I dont think it would have been a problem, that is since misty fixed the spaces issue in the minixp project. Moving the project folder to a non spaced location seems to allow the build to be created and boots into BBLean shell. I got the message (normal): This source has not been tested... (I do not have the Win8.1 Preview you've tested). I have the menu bbLean on a black wallpaper and unfortunately the application freezes. I'll try later with Win8 even if I am happy with Win8PESE. I do not have the wallpaper, but the apps works. no wifi for now, maybe PeNetwork can help, I do not know. For Opera, it would be good to remove the request for updated. I do not see the interest of 2 defragmenters. Shame that Opera does not work, x86, it lacks a browser for x64 architecture or the support for running 32 bit apps. Small detail, a colorful wallpaper would be more friendly and maybe select the Create ISO by default. I have not seen either the addition of driver. What is the difficult part in "minimalist" that you have difficulties with? This is a minimalist 32 or 64-bit WinPE with a GUI shell (BBLean - based on BlackBox for Windows). There are several more "featured" projects, a "minimalist" PE is very likely to be "minimalist", IMNSHO, as soon as you start adding everything (and the kitchen sink ) it will gradually lose it's status of "minimalist"
any x64 build cannot even "properly" be called "minimalist", though . I would say that for a project born just a few days go, it behaves extraordinarily well, I am sure that the few little glitches will be fixed whilst the idea of adding some bloat to it (the Explorer shell) seems to me contradicting the very basic philosophy of the project. bblean is highly configurable, and it is possible to have a "start" button and menu very similar to the original Windows one (with the added possibility of right clicking anywhere). Can you "detail" what your *needs* are? Thanks for testing the project and the feedback. I am now working on adding support if spaces are used in the path - I'm getting there. Sadly (for me) it's not as straightforward as just wrapping everything in quotes! Thanks. I'll look at adding this function - but will probably do so in the "Tools\Create ISO" script. The reason for doing so is to keep the options in the main project script to a minimum - what I consider to be the essentials. Not everyone will want or need to make an ISO and those that do could easily tick a box in the Create ISO script. Thanks also for testing and feedback. One of the future advantages of this project is the ability to verify the source files against known builds and tailor the options to suit that build. As an example - in the WinFE script if 6.2.9200 or 9.3.9431 sources are used (assuming they were verified correctly) then different registry values are applied - SanPolicy 4 in this case. As I don't have access to build 6.3.9600 I thought I'd add it at a later date after testing it works ok. Clicking on help in the main project script (in option "1] Attempt to use Existing Cache") will list the source builds currently 'known' to the project. I'll look into improving network support at a later date. I've never managed to add wifi to a basic build and suspect the overheads are just not worth it. I've not had any issues with missing drivers for my own hardware and much is supported out of the box in WinPE so this has not been a priority - also there is the option to add a driver at runtime via drvload. I discovered JkDefrag close to the completion of the project - liked it and added it. I'm fine with command line tools, but like the GUI of Defraggler and suspect that others might be more comfortable with this. Simply deselect one of them. I couldn't find any lightweight 64-bit web browsers and therefore didn't add one - I wanted to keep the download size to a minimum to save Nuno some bandwidth. Opera has been working fine on my own x86 builds - used mainly for reviewing help/instructions (such as http://diddy.boot-land.net/bcdedit/). Click on bsetroot.exe to get some help with it. See also the documentation for bsetroot.exe. bbLean uses bsetroot.exe to generate the background and then either displays it on its own or lets Windows set the wallpaper, depending on the setting of 'Smart Wallpaper' in 'Configuration->Graphics'. Also any processing of the rootCommand may be disabled in 'Configuration->Graphics'. I removed bsetroot to reduce size, but will look at adding this back as an option for the user. Thanks for the comments - and for the help and support so far provided in this thread. Just out of curiosity - have you tried it? 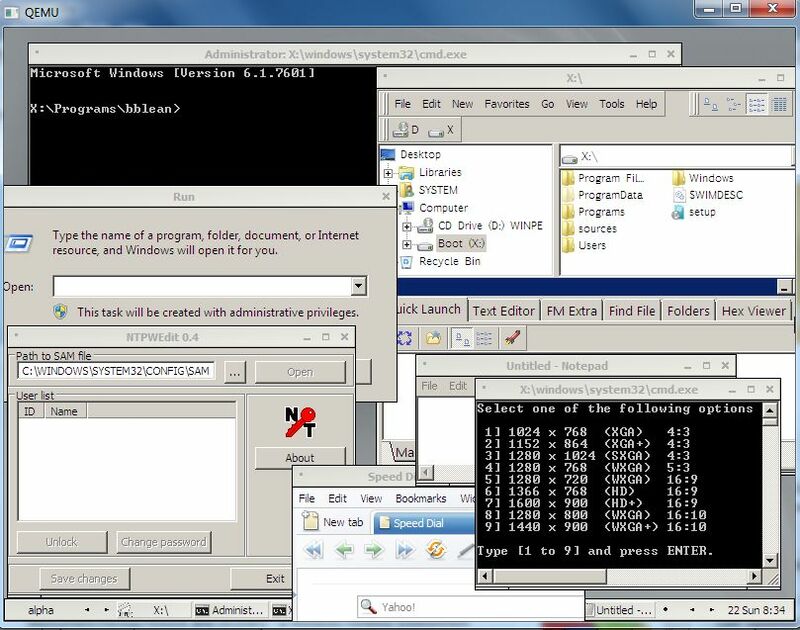 I only quickly made a build from a Windows 7 .iso (32 bit) I had around, and since the use I expect to do in a PE is "minimal", I did not even think of testing things like network (wired or wireless) and of course I am a "sponsor" of bblean since day one (or two) so found nothing "wrong" in this preliminary test. About paths with spaces, allow me a little rant . Using spaces in files or paths is a sure way to make something not work (before or later). It has been like this since the early days of DOS. It will be like this on any OS, the SPACE is a SEPARATOR, the whole stuff derives from MS envy on Apple (OS 6 or 7), but Macs used (and possibly use even today) a completely different approach at filesystem level and the workaround (cannot be really thought as a "solution") MS provided with DOS 7.x/Windows 95 has more than one glitch. It is not like the intended user of a Winbuilder project is a total newbie, the requisite of using not a path/filename containing spaces is not anything actually "important" or "relevant" or precluding "normal" use of the PC. It reminds me a lot about the Eden. You are all set in a paradise on Earth, with only one rule, DO NOT eat the fruits of this particular tree (but you can have all the fruit from any other tree in this immense garden) and what you do? You eat that particular fruit (actually the Devil made you do it ). Same thing, here, you can do anything, but DO NOT use path with spaces. What is the first thing done? Assume that path with spaces are supported and use them. BTW TheHive is innocent, the Devil made him do it . The amount of troubles to have a (maybe) fully path-with-spaces-compliant project (with no guarantee whatsoever to actually reach 100% in a relatively complex project) is so vast that anyone whining about this single limitation should be severely punished! Everyone think of this, why would the good MS guys have changed a few "established" paths containing spaces (and replaced them with path without spaces) in Vista and later? I completely disagree - crucifiction is just too fast a punishment! I discovered what I thought was a serious bug last night and could not get any of the project builds to boot to BBLean shell. After a lot of frustration I traced it back to having unpacked the MistyPE.zip download using Windows 8 (64-bit) built in tools. I'd only just installed this version of Windows as a test environment and hadn't installed 7-zip - which I'd have normally used to unpack the file. The upload was packed using 7-zip. Don't know why this happened, but I've included the error messages that were displayed on booting just in case it's an issue for anyone else. A winpeshl.ini file is present, but no commands were successfully launched. This could be cause by incorrect formatting or an invalid executable name. Please consult the documentation for more information. Bizarrely all of the files appeared to be there in the correct locations - I checked from the command line in the booted project. Call me crazy if you want to - but I actually like Windows 8/8.1. I even like the UI now I've gotten used to it. Windows to go is a major selling point - unfortunatly not available to the great unwashed such as myself - other than the time limited trial I'm currently running. 64-bit on the other hand is completely unnecessary on all of my hardware. as a matter of fact the good MS guys had it wrong on previous BOOTMGR versions (as NTLDR seemingly works allright on those stupidly large clusters). What is UNforgiveable, and so utterly "wrong" that should make people cry, is the completely wrong way the search behaves. Before going through Windows 8.1, I’ll cut directly to the 30-second summary: if you have Windows 8, you’re going to want to upgrade to Windows 8.1. There are a few gotchas (see below), but by and large Win 8.1 is an improvement. On the other hand, if you’re still using Windows 7 and you’re on the fence about migrating to Windows 8, nothing in Win8.1 will sway your decision to upgrade. For traditional Windows users who are perfectly happy with a mouse, a nice screen, and a comfortable keyboard — and who prefer to not poke at big, blinking boxes — Win8.1 brings nothing new to the table. Windows 8′s search charm is a bit funky — it doesn’t work the way most people would expect, but at least it isn’t a stoolie for Microsoft. In Windows 8.1, that changes drastically. By default, when you enter search terms into the Charms bar search box, Win8.1 uses the new “Smart Search” feature to search Everywhere — not just your local system but the Internet, too. If you don’t remember to change the drop-down filter box to something else (such as Files), Smart Search sends every search string you enter to Microsoft. Search your files for “pregnant” or “Aryan nation” or “Anonymous” or “HIV,” and those search terms are passed along — with your Microsoft account information — to the company. Added option to "Tools\Create ISO" script to remove the "Press any key to boot CD..." prompt. Minor edits to project scripts to further improve error checks, warnings, etc. Changed hard coded paths in "Core\Core Files" and "Shell.Then.End\BlackBox Lean" scripts - replacing with "%ProjectDir%". This should avoid any future errors if I decide to change the project name again. I've tested several different sources and they seem to be ok following the above changes. Please test and feed back. I can understand your choice of bbLean, if the goal is to keep it simple and minimalist. Nevertheless, explorer shell remains for me the best one, far ahead Mac OS menu bar or other Shell. A browser seems important to me too, to retrieve information on the web. There is Opera x64, I also saw Cyberbox or Waterfox x64 browser based on Firefox. but yes, they are not really light. but it should be easier with bblean bsetroot which seems very light. 32 Bit Windows versions don't support UEFI. There is the limit of 4 Gb. It is maybe not a real concern for WinPE. Edited by boulcat, 22 September 2013 - 01:37 AM. Thanks. Build with spaces works with this new update. Mainly use spaces and dashes and such to keep things organized within the winbuilder folder that has almost all reboot projects and things related to it. Like it in that location. Makes sense if youre going to build a boot iso. Didnt see a wallpaper option to choose the custom image. It has the option, but no browse option to point to the image. The question was more aimed to "which particular features of the Explorer shell are a *need* for you? As said it is possible to setup bblean in such a way that it behaves and looks very similar to the Explorer shell. A tool, in my perverted mind, is a tool. It needs to work, it doesn't normally need to be "nice looking". About 32 bit vs. 64 bit, most boards currently allow "BIOS compatibility mode", i.e. right now the probabilities of booting a 32 bit bit Windows PE on a "random" failed system are above 99% (completely faked data ) : all the BIOS based systems + 99.5% (still faked data) of those EFI/UEFI based. In the future (I expect several years for this to happen) all or almost all boards/PC's will be EFI/UEFI based and 64 bit, so there will be a reversing of the percentages, but if you are going to repair computers you will be needing both builds/architectures (and also some other booting environments, you never know). BTW, I am hopeful that some of the good programming guys will make a "generic" EFI/UEFI extension capable of emulating a BIOS, sooner or later. Couldn't see anything in that key in terms of wallpaper settings. Tried using bsetroot and it didn't work with 6.3.9431 or 6.2.9200 sources. Also tried changing the settings in the "DEFAULT\Control Panel\Desktop" "Wallpaper" key(s). Still not working. Back to the drawing board. Interestingly when this key was edited on WinPE 3.1 it worked - provided that a .bmp type image was used! Imagine my surprise when I discovered that this doesn't translate as "You're Mad" (or mental, bonkers, crazy, nutter, nut job, a fruit loop, etc). I prefer the English expression - "horses for courses". Do I need to activate Windows To Go everytime I roam? No, Windows To Go requires volume activation; either using the Key Management Service (KMS) server in your organization or using Active Directory based volume activation. The Windows To Go workspace will not need to be reactivated every time you roam. KMS activates Windows on a local network, eliminating the need for individual computers to connect to Microsoft. To remain activated, KMS client computers must renew their activation by connecting to the KMS host on periodic basis. This typically occurs as soon as the user has access to the corporate network (either through a direct connection on-premises or a through remote connection using DirectAccess or a virtual private network connection), once activated the machine will not need to be activated again until the activation validity interval has passed. In a KMS configuration the activation validity interval is 180 days. ...otherwise an activated Windows To Go could greatly assist piracy - unless activation is somehow locked to the device it is first activated/installed on. A pleasure. I like the occasional challenge. I'll look at adding this to the next release. In the meantime just add "winpe.bmp" to the "\Projects\Cache\Programs\Wallpaper" directory. As you will hopefully be aware from reading the above (and other posts), Wallpaper is not working with/in WinPE 4 or 5. After reading numerous reports that it's possible to add a custom wallpaper to WinPE 5.0 by replacing "winpe.jpg" I thought I'd experiment. I built a standard WinPE 5.0 (using ADK) with the only customisation being to replace winpe.jpg with a different image. On booting the disk my custom wallpaper was (at long bl**dy last) displayed . 7-zip can't open the ADK boot.wim file - making it hard to browse it's contents without mounting it. I then noticed that 7-zip could open boot.wim after I'd added my winpe.jpg file and ran the wimlib-imagex optimize command! Weird - I then noticed that the WinPE 5.0 boot.wim (from ADK) does not have "winpeshl.ini". Despite not containing this file, WinPE does read and apply it's contents if it's added - otherwise bblean would not have been starting up. I then added a command to start bblean via startnet.cmd instead of adding a winpeshl.ini file. On booting this disk my custom wallpaper was momentarily displayed until bblean started - then the black background was again displayed! Thus ends my attempts to add wallpaper to WinPE 4 or 5! If anyone else figures this out then I'll be happy to look at adding it to the project. JFYI, the hypothesis you make are not excluded by the latin phrase. In it's complete form of de gustibus non est disputandum (or de gustibus non disputandum est ) it simply means "you don't discuss tastes", which can carry with it two meanings, a more "gentle" one meaning respect for diverging opinions (hence the smiley) but also a more "blunt" meaning that it is futile and useless to discuss personal tastes as there will never be a change of opinion based on the discussion. A lavare la testa all'asino ci si rimette il tempo ed il ranno. Literally "when you wash a donkey's head you lose the time and the soap". So, if you want to feel offended, you actually can . being copied during the build. box to select a custom image. build process - applies to "Create a Cache from WinRE"
to be executed pre or post processing! * Added MWSnap to the included programs. It is my pleasure to tell you MistyPE runs great under XP-SP3 Spanish version, using as souce Win 7 SP-1 x86 Spanish version. Great news - I've been meaning to test the build process in Windows XP for several weeks but never seen to get the time to set up a VM or install XP on my laptop - I'm easily distracted. 1.- Could you please make an Script for disk manager?, it is very usefull for me to resize partitions; or a 3rd. party GUI alternative. 2.- I didn't found a way to change to Spanish keyboard. 3.- How to add some portable applications?, an extras file could be good. Thanks for this great little tool. Edited by alacran, 12 October 2013 - 03:01 PM. 1. - If you are referring to the native disk management console then I have no plans to try to add this as there are far too many dependancies. If you know of any lite third party alternatives please let me know. I actually prefer using Diskpart now that I've got my head around the syntax. I have a diskpark guide that I keep meaning to convert to .pdf and include with the project in the future - time permitting. 2. - on the fly keyboard changes is on my list of things to do. Does your build not default to spanish keyboard (you mentioned using spanish source files in a previous post)? Try this for now - http://reboot.pro/fi...layout-changer/. Setting a different keyboard during the build process is also on my to do list. en-GB can currently be set - I'll add spanish and a few others soon. 3. - I generally add programs to a usb drive and use a file manager to launch them. I'm currently adding the option to add non essential programs (everything currently in the programs section) to the root folder of a CD/DVD/USB - not in boot.wim. I've re-written about half of the program scripts and am working my way through the rest. I'll look at adding keyboard support afterwards.